When skill, intention, training, and knowledge are equalized there is only one area that will reveal the Real Estate Agent who will succeed versus the one who will struggle to make a good living; it is the implementation of a trusted Personal-Management System. What is a personal-management system? It is a trusted way of interacting with one’s business plan, calendar, tasks, communications, activities, habits, and your most precious commodity: Time. 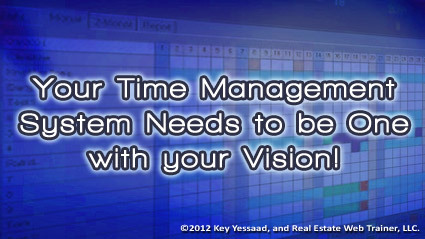 It is not a piece of software but a way of relating to your most efficient actions and follow-ups. For example some use Outlook and related tools to organize all of their business; others use Gmail and its related tools to do just the same; I even know some who use paper calendars with written notes to deliver the best service and design to their business. As I said it is not a set of software or newfangled tablets you need to buy; it is more habit driven than tools driven. Reply Lester S "Lester the Lister"
I am in the middle of David Allen's book, Getting Things Done, and in midst of piecing together a business plan that is very much system-centric. Your post hits home and resonates loud and clear! One of my toughest challenges, other than overcoming my biggest obstacle (myself), has been finding synergistic energy from my environment.....it is plentiful once you look in the right places! I am convinced that with this systemic approach I can triple my business (from the '02-'06 yrs) while achieving a better balance, higher sense of reward and accomplishment. Thank you.